Customer Journey Mapping is an excellent way of examining the steps customers go through when they engage with your organisation, highlighting where value is added and where there is unnecessary waste and delay. Customer Journey Mapping is similar to traditional process mapping, but always done from a customer perspective and only ever based on live cases i.e. what actually happens in practice. The process involves reviewing live cases and portraying them as individual journeys to show when and how often contact was made between the organisation and customer during each enquiry. Customer Journey Mapping is an extremely cost effective way of uncovering what is really going on and where improvements need to be made to ensure customers come back again and again. 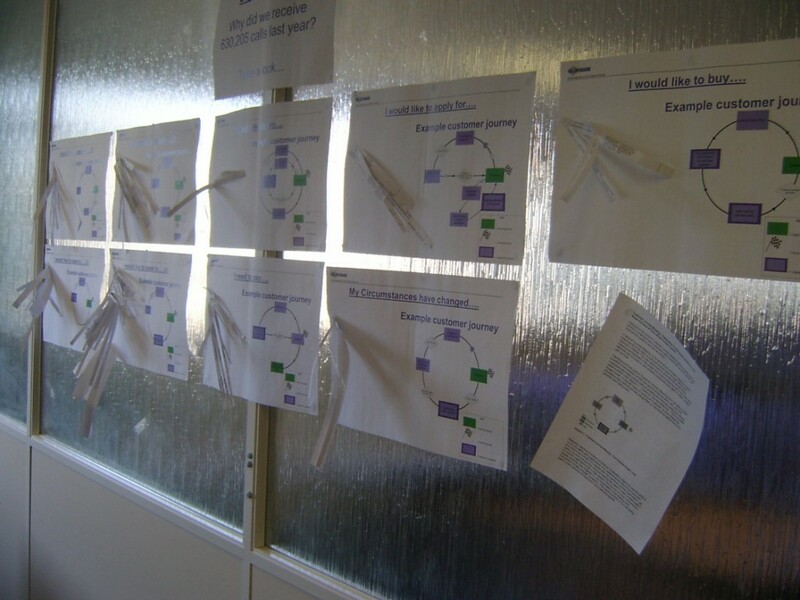 We strongly recommend that Customer Journey Mapping forms the basis of any customer focused improvement activity. If you would like to discuss Customer Journey Mapping further, including how best to implement it, please make contact using the form below. Remember at PACE-Consulting.co.uk you are dealing direct and so all services are offered at extremely competitive daily rates or as fixed priced packages to ensure you get the maximum return on your investment. Ever thought you are going around in circles? Well in our view if you can map the perfect circle between you and your customers then that is no bad thing. Welcome to the world of Customer Journey Mapping, an important aspect of any structured improvement activity. Customer Journey Mapping provides an invaluable insight into exactly what is occurring within any organisation. For instance where did the journey start and where did it finish? If it started with the customer did the organisation get back soon enough to help prevent the customer feeling the need to make contact again? Or did the organisation fail in that aspect, forcing further unnecessary contacts? 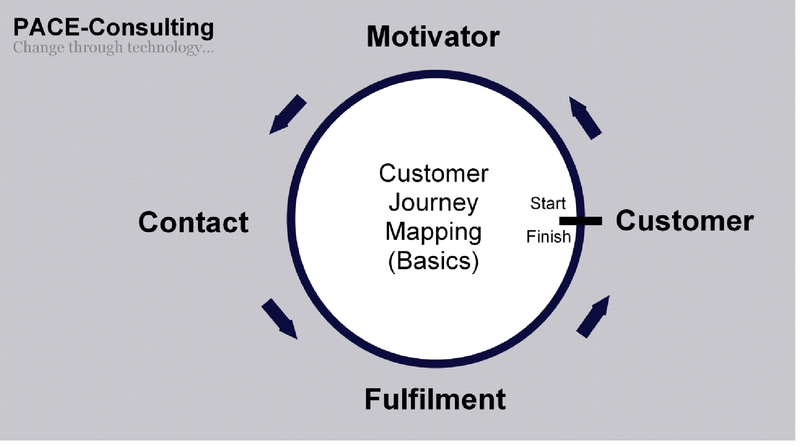 At PACE-Consulting.co.uk we map Customer Journeys as circles because the visual impact of circles is immense. The ‘Complete Single Circle’ shown above starting and finishing with the customer, looks right because put simply, it is right. Make the circle incomplete or change its shape and anyone passing can’t help but stop and look again, something visually is not quite correct, or needs improving. This makes it a very effective tool for highlighting where further work needs to be done. This is definitely one case where going around in circles is no bad thing, because the primary goal with Customer Journey Mapping is to uncover where that isn’t the case and prompt someone to do something about it. Maybe the circle is broken, the question is, why? Maybe there are two or three concentric circles as customers repeatedly come back to check on progress before your organisation has responded, so again what is going wrong? Worse is if one of those return journeys result in a formal complaint or negative feedback on your website, or worse still Facebook or Twitter. As well as the circles themselves, a related area of investigation is where Customer Value is added. Customers made contact with you for a reason after all, maybe even parting with their hard earned cash at the same time. 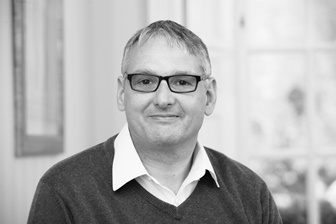 The questions here relate to where value is added, if that is in the right place in the process or occurring too late, particularly where a contact centre is used, as well as if there is any waste that needs to be reduced or eliminated altogether. Customer Journey Mapping inevitably requires an investment in time and energy, because it is not the theoretical journey you are interested in, it is what happens in practice. That means reviewing live or historical cases, conducting mystery shopping exercises and even performing undercover investigations as staff become secret agents in their own organisation. Don’t worry too much about the potential negative reaction from doing these activities, and there will be some, we are confident that as the realisation dawns on the positive results that can be achieved, such as improving customer satisfaction, exactly how it was achieved will quickly get forgotten. If you would like to discuss Customer Journey Mapping any further please make contact using the form below. Remember at PACE-Consulting.co.uk you are dealing direct and so all services are offered at extremely competitive daily rates or as fixed priced packages to ensure you get the maximum return on your investment. Excellent content and delivery. Matt is a superb resource with a pragmatic approach. Jason – Many thanks, Matt.